We are currently in the midst of potty training our 2 1/2 year old Jordan. Once Jasmine arrived I was literally changing a diaper every 20 min or less and was determined to get Jordan out of diapers. I have found and resorted to the three P’s which have been working well so far. 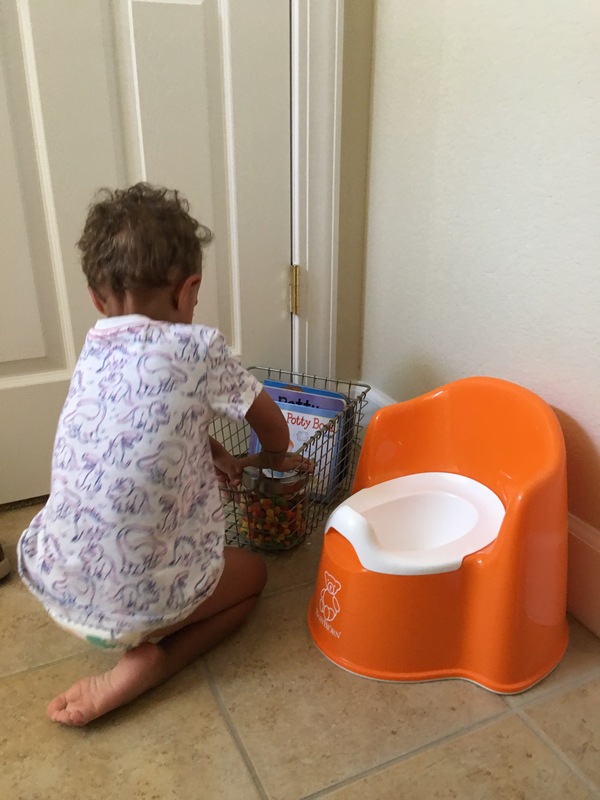 Preparing my toddler for the transition of not peeing or pooping in his diaper was key. We started by simply introducing the potty chair and talking about going on the potty (which by the way he had no interest in at first). 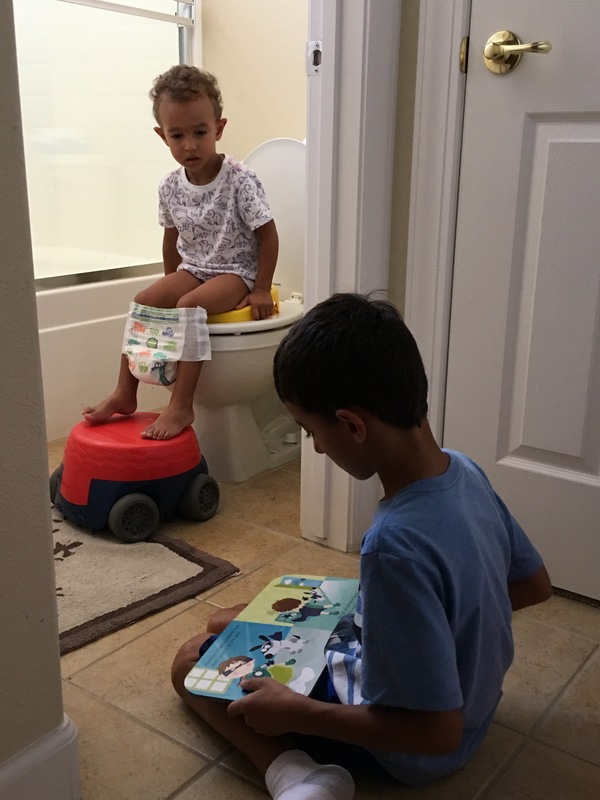 Luckily he has an older brother who he would watch use the big boy potty and he began to get curious. I must admit we tried to push him using the potty chair when he was not ready and it didn’t end well, WAIT!!! We stopped all potty talk and planned on reevaluating when we witnessed a few more “ready signs”. Shortly, after no potty talk he wanted to be changed immediately after pooping or peeing so we took that opportunity to reintroduce the potty. 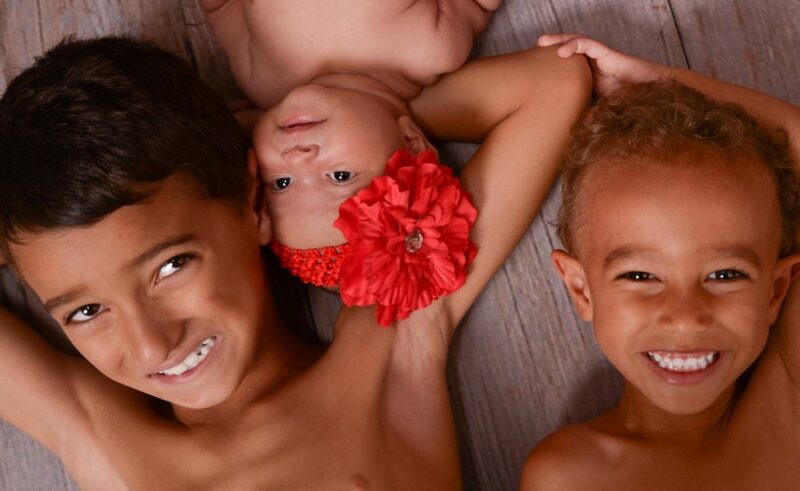 Preparing for this big, scary change was important for both him and us to making the diaper free transition. 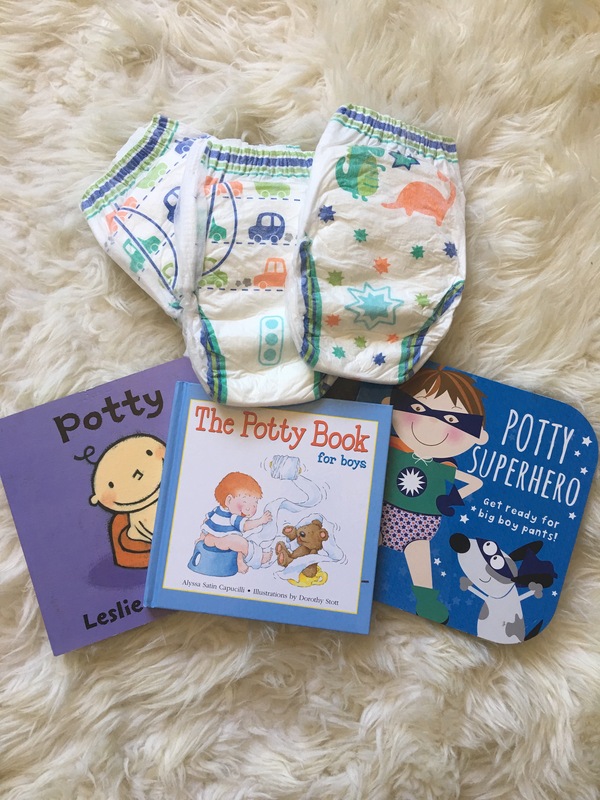 I suggest getting a few age appropriate, fun potty books and training pants for the preparation stage. 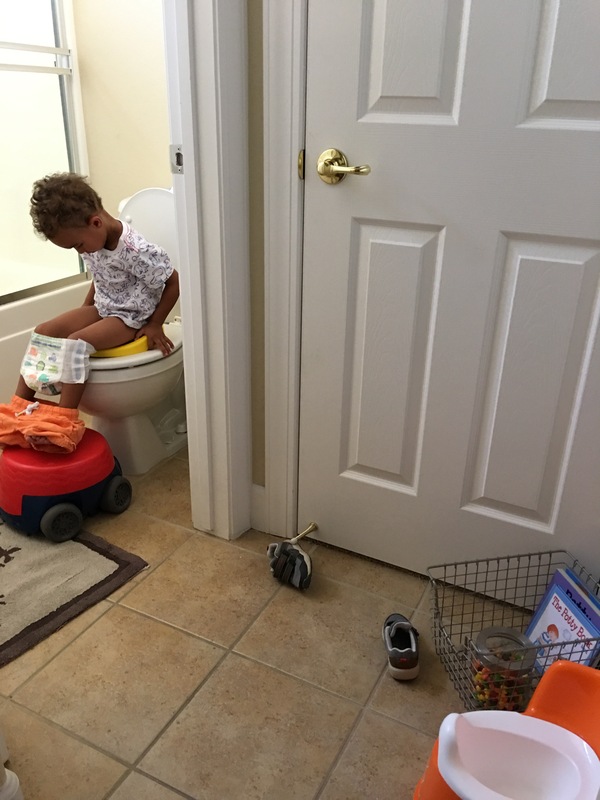 I can’t stress the importance of patience when beginning to potty train. I remember looking at my watch and realizing I had spent nearly 3 hours in the bathroom one morning. I reverted back to I do not want to be changing diapers every 20 minutes between my newborn and toddler boy so the 3 hours was well worth the time to invest. I could see some frustration when Jordan would try to go to the bathroom and nothing happened immediate for him and this is where the sit and wait notion comes to play. Get some magazines, books, or iPod for music and camp out!! Patience is a virtue. Once Jordan was well on his way using the potty continuing to ask him every hour or so was necessary for both of us to continue the diaper free process. I admit there has been a few times where I got busy and forgot to ask him and we had a few accidents. Also, making sure we went to the bathroom before leaving the house and even taking a potty chair with us and having him use his own potty was comforting for him. Persistence and not giving up once there are a few set backs is what is getting us through this transition. Preparation, patience, and persistence is what I found to work for us. There are so many great resources available to research when you have reached this exciting transition for your toddler so please do what works for you. I also, found it does not hurt to reward my big boy with a skittle or two. Celebrating is also a great way to continue reaching the diaper free world! Having a few skittles for yourself to doesn’t hurt! It can be exhausting at times, but we got through it and to see the excitement my Jordan is coming into and a new found independence is so rewarding. 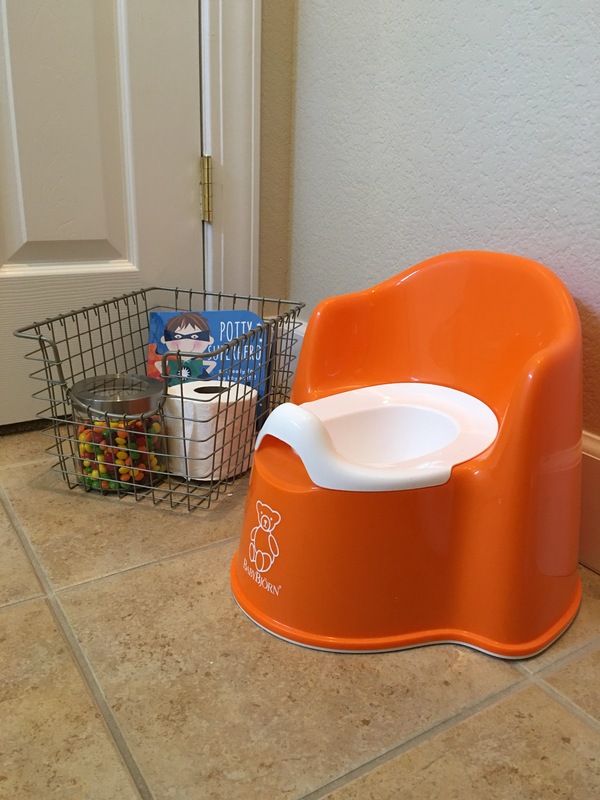 Hope this was helpful and would love to hear your potty training tips and stories!